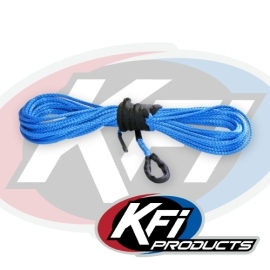 1/4" Blue Synthetic ATV Winch Cable (Original Blue) for 4000-5000lb winches. Synthetic fiber rope has a higher breaking strength than that of steel cable and it is lighter. It won't bind up or develop those sharp frays that give nasty slivers. NOTE: It is recommended that if you are replacing a metal cable winch line that you purchase a new roller fairlead or aluminum hawse fairlead. This will eliminate possible damage to your new synthetic cable from metal burrs that were produced from your metal cable line. It is also recommended that you remove all burrs from your cable spindle before assembly.